My mother, wife and daughter were coming home from a family party. when we got out of our car ready to enter our house i looked behind me toward the sky for some unknown reason and i saw 3 very bright orangish lights glowing in the sky. i called for my wife to turn around. 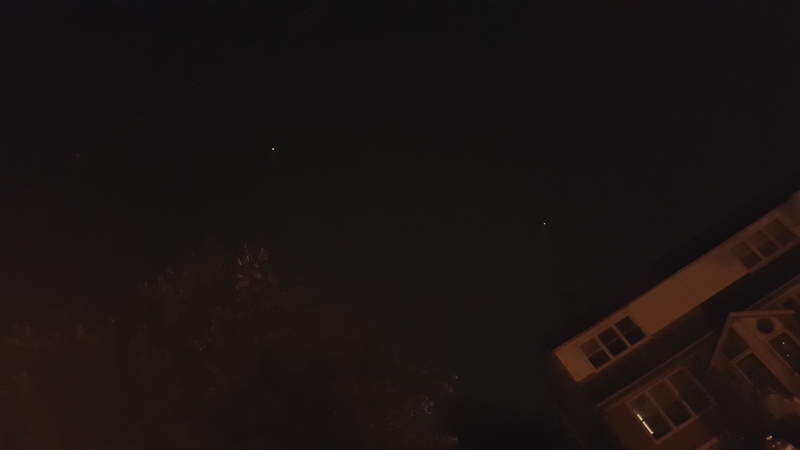 at that point my whole family turned around looked toward the sky and also say the 3 very bright lights in a perfect triangle formation (a very large triangle formation) with 1 light trailing behind it. as the 1st 3 lights glided overhead without any sound at all they in quick succession just vanished in to the night sky. when the 4th object got to around the same area it kinda blinked itself out of the night sky. there is am airport right around the corner from here and we have made a habit of watching the airplanes fly over head, take off and land. but this was like nothing i've ever seen before. the lights were so bright and make no sound. at 1st we thought it might be helicopters flying in formation, but for the size of them and the fact that they made absolutely no sound it just could not have been. then in mid flight they just disappeared. it was just incredible.